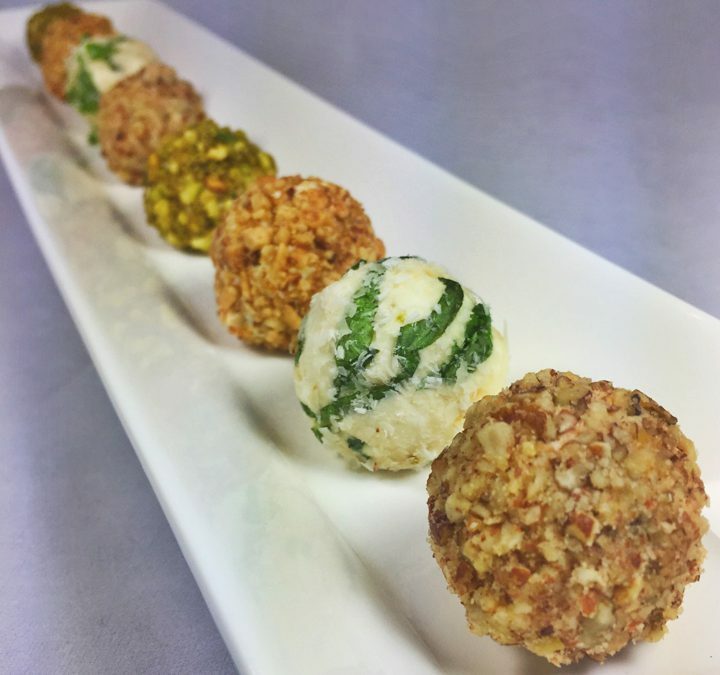 It’s a cheese truffle tasting ready for your next holiday party. With the appearance of tiny cheese balls, each one of these delights contains a tasty center ranging from a dried cherry, to an olive, date, or sundried tomato. A base cheese recipe is created then divided into four bowls for adding flavors to make four different seasoned versions to go with each tasty center. With lots of flexibility, you can choose if you want to make one flavor or all four. The flavor recipes below use one-fourth of the base cheese recipe each. So be sure to add extra seasonings accordingly if you decide to make only one, two or three different versions. Mix together well and divide evenly into four bowls. Add the following flavors to create four unique truffles. Combine ½ teaspoon lemon zest, 1 ½ teaspoons finely chopped jalapeno, and 2 tablespoons finely grated cheddar cheese. Roll mixture into ¾ inch size balls. Using your thumb, make a hole in each ball, press into the center of your truffle ½ sundried tomato. (Use sun-dried tomatoes packed in oil for best results.) Roll in ⅓ cup finely chopped almonds and refrigerate until ready to serve. Combine ½ teaspoon orange zest, ½ teaspoon cinnamon, and ½ teaspoon ginger. Roll mixture into ¾ inch size balls. Using your thumb, make a hole in each ball, press into the center of your truffle ½ dried date. Roll in ⅓ cup finely chopped pecans and refrigerate until ready to serve. Combine ½ teaspoon fresh thyme, 1 teaspoon honey, and ½ teaspoon lemon zest into one bowl of the cheese mixture. Roll mixture into ¾ inch size balls. Using your thumb, make a hole in each ball, press into the center of your truffle a dried cherry. Roll in ⅓ cup finely chopped pistachios and refrigerate until ready to serve.